San Luis Obispo County Supervisor Bruce Gibson planted 500 new citrus trees on his rural Cayucos property several months ago while pushing to impose tough water conservation measures on agriculturalists in the Paso Robles Groundwater Basin. 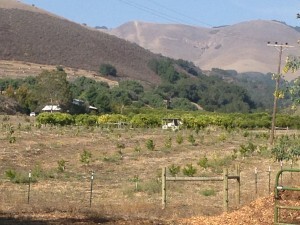 Neighbors in rural Cayucos say that while they have been struggling to water their orchards because of drought conditions, District 2 Supervisor Bruce Gibson planted an additional 500 citrus trees on his Cottontail Creek Road ranch. Gibson, who recently announced that he is running for a third term, placed the ranch on the market in June after his wife, San Luis Obispo physician Dr. Grace Crittenden, filed for divorce. Last November, the supervisor admitted publicly to having a long-term affair with his administrative assistant Cherie Aispuro. Gibson’s Cottontail Creek Road property includes 800 mature, 250 mid-size and 500 newly planted citrus trees for an asking price of $2,595,000, according to the property listing. With approximately 15 acres of citrus, Gibson’s ranch would need about 30 acre feet of water a year in addition to rainfall. Irrigation experts from University of California Cooperative Extension and Cal Poly, as well as neighbors of Gibson, said an acre of citrus trees in the Cayucos area requires about two acre feet of irrigation water per year. Six years ago, Gibson pulled 11 acres of citrus trees and reduced his orchards from 20 acres to nine acres. Several years ago, he planted two additional acres, and a few months ago he planted about four acres of citrus trees, increasing his crop to about 15 acres, according to his property listing and several neighbors. Gibson did not respond to questions about his water usage. His ranch has two wells — one onsite and one on a neighboring property owned by the Whale Rock Reservoir, according to the listing and the reservoir office. Upon the creation of Whale Rock Reservoir in the 1960s, four neighboring properties with wells that would be influenced by the water table received specific water rights, Whale Rock Reservoir Supervisor Noah Evans said. Gibson’s offsite well is allotted 15 acre feet of pumping a year. The well is metered and monitored by Whale Rock staff. The household well on Gibson’s property is not metered. It is also unclear whether the permit for the household well places any restrictions on the owner’s ability to pump water. Following a CalCoastNews request, San Luis Obispo County Environmental Health Services staff could not locate the permit for Gibson’s household well in its database. But, Environmental Health supervisor Richard Lichtenfels said he would try to provide a physical copy of the well permit in the future. Earlier this month, the San Luis Obispo County Board of Supervisors extended its urgency ordinance that restricts water use in the Paso Robles Groundwater Basin. The basin spans most of Northern San Luis Obispo County east of Highway 101 and includes rural Atascadero, Templeton and Paso Robles. The ordinance, which lasts until 2015, prohibits new development in the Paso Robles basin that uses more water than it saves. Gibson led the effort to adopt the ordinance and initially called for water usage restrictions twice as steep as what the board adopted. He said the water moratorium was necessary to stabilize the basin. Opponents of the moratorium argued that their property values would plummet due to the ordinance prohibiting them from planting on their undeveloped properties. The supervisors have not restricted water usage for additional areas of the county impacted by the drought and the lowest year to date rainfall in recorded history. Hey, At least he isn’t planting ficus trees on narrow sidewalks in a downtown retail district. I just don’t understand how this guy keeps getting elected – tree planting or not. Those trees are probably 5 years away from producing anything, so if the new owner keeps them, it’ll be they who has to deal with the water situation. The fact that the avocado growers up Hwy 41 have to truck in water, and have been doing so for more than 2 years, shows the difficulties of irrigated ag crops. They must be spending a bloody fortune to truck that water in but they do it because they must have $20 million worth of trees, many that are from the original plantings in the late 70s. Who knows, the new owner of Gibson’s ranch might not even be a farmer, it is after all a very difficult life, full of long days and sleepless nights when the frost hits. I’d bet at the price he was asking, the new owner is some Yuppie millionaire who has no interest in growing oranges. Then again if the guy does continue to grow them, that’s a good thing. No other industry exists where one can take some seeds, soil, sunshine and water and grow money. Plus oranges from Cayucos are amazing. The juiciest ones I’ve ever gotten in the local stores and far better than most of what comes here from Fresno. And they’re only about $3 a bag at Cookie Crook. I hear ya Spork. I have contact Lynette via personal email in the past, she didn’t respond. Lynette, direct your question to CDM Smith, they’ve been paid millions, I’m sure they’ll be happy to answer all your questions. The problem here is the appearance of impropriety. One would think that any normal person would hold off on all activities that give the appearance of being self serving and greedy. Just add this to the list of things Bruce has done for us… or is that to us? Right. He is selling his ranch and YOU determine that planting trees appears to be self serving and greedy? I guess that is a step better than saying that he is self serving and greedy. And you determine what a “normal” person does? Gee, I don’t know, he is selling his ranch. Normal people usually try to fix up a place before they sell it and a citrus ranch usually includes trees. He has net less trees than what he started with on top of it. What exactly has he done “to” us? Seems to me putting in the work he did to get us a sewer in Los Osos is a giant plus that he did FOR us. I think the ranch sold. At least, it’s no longer on Zillow. It’s the construction water from Los Osos! Just ask the sewer opponents, They’ll swear this is just more collateral damage caused by the construction of a sewer. If I were King of the County, Not queen, not duke, not prince. My regal robes of the County, would be satin, not cotton, not chintz. District 2, the only place one can find the classic tale of The Wizard of Oz played as a one man show. And, Dorothy (pilots her private plane over the rainbow on the public’s dime). Enjoy the guest appearance by Tom Fulks as Mayor of Munchkin City. Show times are every Tuesday at 9:00am now through the first Tuesday in November 2014. It’s going to be a looooooong campaign season. Why bring Ted Cruz into this? Why bring a pathetic attempt at humor through personal vapidness. Funny how when my vapid comments about people on the left are made, the moderator is quick to swoop in… but my shallow comments about people of the right seem to stay, as yours has. Girls, this story is not about Los Osos sewer. This is about a corrupt, immoral, rude and do as I say not want I do evil supervisor. He thinks he is the leader of the kingdom and we his ignorant serfs. We shall see soon! You are so right on this one SLOBIRD, I shouldn’t have let Lynette take me down that long road in this venue. The only parallel to the sewer is Gibson’s hypocritical stance on water. He is on video tape saying dumping construction water to Morro Bay was a “last resort” (July 22, 2013), now he defends it vehemently (August 21, 2013). Another irony I see is that avocado orchards in the Chorro Valley are so thirsty they are trucking water from Whale Rock in to water the crop, while we send our perfectly good for this purpose water to the bay to be lost forever. Right, lots of diesel belching trucks coming in to get that that water would be the next thing the complainers would be moaning about. Gibson’s actions in the Los Osos sewer issue IS pertinent to any discussion about Gibson’s actions as a county supervisor. Gibson remains mute regarding the defiling of the bay, allowing toxin- and sediment-laden “construction water” to be dumped, by the millions of gallons, into the bay. His “construction water” hypocrisy echoes his Paso GW Basin restrictions hypocrisy. They both show a pattern of official behavior that is unethical and hypocritical. Um, Mary, the water is tested and is not toxin and sediment laden…..but I know, why let facts get in the way of your ranting…. What the RWQCB didn’t require contractors to tests was any Nitrate, the very constituent that led us to a sewer. Nitrates have been tested by an independent party and they exceed drinking water standard, which would make the water perfect for irrigation and not so good for the bay. Lynette, I’m sure you recall the CDM Smith Dewatering Plan, recommends farms in the Los Osos Valley could use it. The purple pipe is laid, why not pump it out there. (No additional trucks belching). On the up side, it is reassuring to know that the water is above the “drinking water standard” in terms of nitrate, so it only reinforces the fact that we need a sewer, as that fact seems to slip the mind of some in town. BTW, who is paying for this extra testing and why? The thing about the high groundwater is it is not septic water. Leachfields are lower than the “first water” comprised of rain water, irrigation, etc. High Nitrates directly dumped into the bay in higher volumes than naturally occurs is a bad idea. I seem to recall that some leach pits are discharging right into the high ground water. You are so right Lynette, the purple pipe is not complete, my mistake. The turquoise blue is. Use that to pump high groundwater to the farms, just like CDM Smith suggested. Pump trench water from where (use what pumps?) and how is the turquoise pipe connected to the farms? People dump all kinds of toxins and poisons into the soil where they live. That’s why water purveyors like using groundwater….less chance of it containing toxins and sediments if it is pulled from below where people can access it. Of course, that groundwater-safety norm goes out the window if there is any fracking done near, in or under the GW basin.